A member of SCBWI, IBPA, Inscribe & The Word Guild, Irish would like to continue doing something about those ideas that get downloaded into her brain at 2 AM. Sometimes God's creatures need a helping hand when they become lost or stuck. 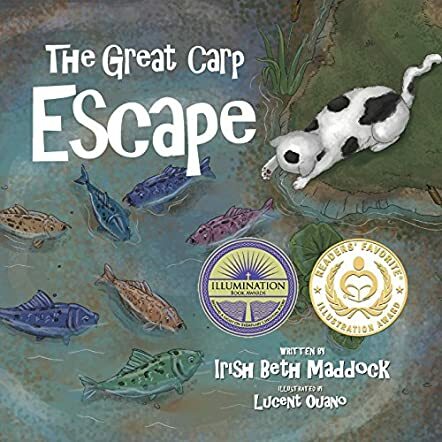 The Great Carp Escape by Irish Beth Maddock and illustrated by Lucent Ouano tells the story of how some ugly fish are treated just the same as the more beautiful of God's creatures. Beth and Paul enjoyed playing along the edge of the lake, spending their summer days watching the minnows and digging for clams in the mud. They discovered another fish, a rather ugly one near the drooping willows. That ugly fish was a carp, not a particularly pleasing sight for the two. They tended to stay away from the drooping willows along the edge of the lake to avoid having the carp nibble on their toes. One spring, however, when the flood waters came, a school of carp was trapped in a pool. With no way to escape, the ugly fish would never make it back to the lake. Would Beth and Paul let them die or was there a way to help them out? You'll have to read the story to find out. Irish Beth Maddock has written a simple story with a sound message in The Great Carp Escape. Although carp are not particularly attractive, they are one of God's creatures and in their way have a certain sort of beauty that is all their own. It is impossible not to be drawn into this story without fully appreciating the rich colors and awesome detail. A simple message with profound meaning and illustrated beautifully, The Great Carp Escape is a great addition to any child's book collection.